Professional, Reliable and Responsible! 24/7 - 365 days a year! We can ship anything, anywhere. 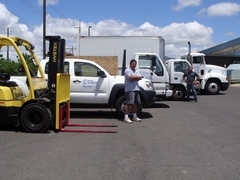 Oahu Express provides shipping to Hawaii via ocean and air freight modes. We also provide the complete package of trucking, warehousing, and associated logistics services. If you are looking to ship to Hawaii or ship from Hawaii, we offer a complete line of logistics services. We have shipped as far as Italy, and as far west as Indonesia from the Hawaiian Islands. Our mission is to provide an unparalleled level of diversified services without sacrificing customer service and professionalism. We implement a Six Sigma approach constantly improving our standards of performance. Oahu Express is a Hawaiian owned, Service Disabled Veteran, Small Business serving Hawaii for over 35 years (1981-2016). We welcome any opportunity to provide your shipping requirements and earn your trust. Aloha!